In the distant past we shared our life with a German Shepherd. After thirteen wonderful years together she passed away. We invested a great deal of time researching breeders for another German Shepherd, going to dog shows and talking with owners but were devastated with what they were doing to the breed. So we decided to find a breed of dog that was sound in wind and limb and had not had any tinkering done to it by a breed club. We discovered the Eurasier. We were both thrilled when we eventually got Enya, our first furry Eurasier daughter. Like most folks we would have been very happy just having Enya as a companion but we attended a Eurasier event, a fun dog show competition, judged by a very experienced German judge who asked us to consider becoming breeders. Bearing in mind, what we had experienced with the German Shepherd saga, we made a decision to not only do it as ethically as we could but also for the benefit of the breed. With fantastic help from Brigitte and her contacts in Europe we successfully bred four litters. From the last litter we kept Jazmine, a sweet girl who is gregarious with other dogs, has brilliant health result scores, but is overly reserved with people. I suppose it demonstrates our commitment for only doing the right thing by not using her for breeding and passing on that trait. Having spent over thirty years working as a research zoologist at the Natural History Museum in London, I am now happily retired. This allows me much more time to pursue other interests such as classical music and general natural history, as well as to enjoy our three wonderful Eurasiers, all different but each a delight in her own way. I am fascinated by the role that the famous Austrian ethologist, Konrad Lorenz, played in the development of the Eurasier, for me the perfect breed of dog. Brigitte’s interest in dogs deepened during her studies of biology in her native Austria. 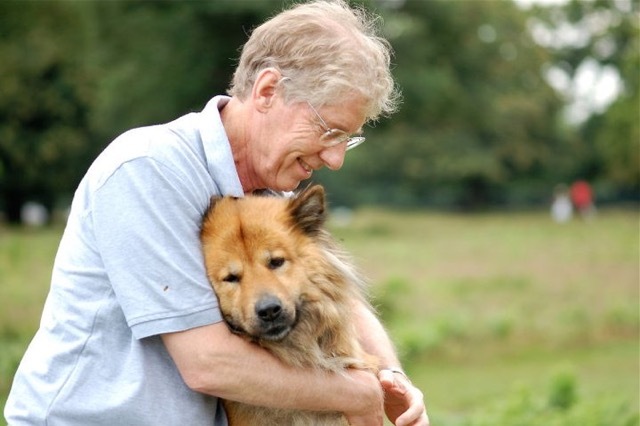 In her search for the ideal companion dog, she encountered the Eurasier in the 1980's, and has never looked back! Having been a Eurasier owner for 30 years, and a breeder for the last 10, she presently owns three Eurasiers, one the only German-bred Eurasier in the UK (and a junior champion in her ‘homeland’), one home-bred, and the third a Canadian import. In the process she has found many like-minded friends all over the world. Because of these interests and professional background, health concerns and behaviour have been at the forefront of her dog-related work. As a result of her expertise in this field, she was elected onto the Health Committee of the International Federation for Eurasier Breeding (IFEZ) in 2012. Her canine interests range from health, behaviour/training, agility and obedience, to breeding and showing. Having headed UK Eurasier Rescue, she currently focuses mainly on her roles as UK Breed Health Coordinator and S.E.A. Health Coordinator. In 2015 she qualified as a Eurasier judge and has frequently organized breed seminars for conformation judges as well as interested owners. Brigitte is a very empathetic person who goes out of her way to help others, people as well as dogs, always putting the breed’s and the dogs’ best interest first. I was first introduced to Eurasiers a few years back at the London National Pet Show en route to see the Golden Retrievers. However, when we had a chance to talk to various owners and breeders (including Brigitte) we were convinced and have not looked back since. Since then we turned our attention solely to one day welcoming a Eurasier into our family. Luckily, we managed to convince Brigitte (Alphacanis) and Caroline (Darchen) to give us one of their puppies and in August 2017, we welcomed home Alphacanis Winnie - our little bundle of joy. As a first time dog owner I can’t explain how amazing and beautiful the breed is. Winnie has never failed to make us smile after a tiring day at work, or indeed when she runs up to every dog in the park to get them to play with her. She has pushed us out of our boundary (for the better) and has always taken care of us in her own little way. We are very excited to be a part of the committee. We look forward to welcoming you and your pup! Please do not hesitate to reach out with questions or if you’d like to know a little more about the breed. I have been owned by a dog of one sort or another for most of my life and developed an interest in showing in the mid 90's when we got our Anatolian Karabash; definitely not the easiest dog to start with! Since 1996 I have owned and bred Tibetan Mastiffs, breeding my first litter in 1999 which included Int Ch Darchen Born to be Wild and German Ch Darchen Three Times a Lady. More recent litters included Darchen Jampo, winner of the first CC for Tibetan Mastiff at Crufts 2015. In 2000 I was introduced to the Eurasier, and decided to import Roxy from France. She was the most loyal and beautiful girl, but sadly was never bred from as she had luxating patellas and Hypothyroidism. By this time I was totally smitten by Eurasiers and imported Tasha who had the most sweet and gentle nature and went on to have two litters. More recently, the beautiful Danni (Alphacanis Danae) joined our family. Bred by Brigitte Mordan-Grimm, Danae is adored by all the family, both human and canine. Our journey with this wonderful breed continues...! I spent years researching the right breed for me before finally settling on the Eurasier. My boy Iorek is my first ever dog and he's an absolute joy. He's so affectionate, I can't imagine a better companion.